The Polo FortyFive Chronograph by Piaget is a luxury sports watch, which is not the type that most people associate the Piaget brand with. Piaget is most known for producing high-end men’s and women’s watches and jewelry. Founded in 1874 by a man whose last name was lent to the brand. So, now Piaget is spreading the word that it too deserves to be known as a producer of luxury sports watches and is doing so by getting high profile athletes to simply wear the watch and be seen. Not a bad deal for anyone involved. Piaget recently gave one of their Polo 45 Chronographs to Fernando Torres, the well known Spanish soccer player who plays for both the Liverpool and Spanish national teams. Torres, a handsome guy will wear the watch when out in public and Piaget is hoping that people will notice, want one and then buy one. Whether Torres is being paid is unknown but since each of these sporty luxury watches sells for $17,900 we can assume that he’s happy just to get a free one. The Polo FortyFive is named after the 45 minutes that a polo match lasts and showcases what is a “first” for Piaget – combining titanium, injected rubber and steel. The design has been purposely revamped from the other watches in this collection: new design, new curves, gadrooned screw-lock crown, rubber capped push pieces and crown, black PVD treated oscillating weight, triple folding clasp with safety mechanisms and summer / winter positions. The grade 5 titanium that was selected for the case is the only type that can be polished. The Piaget Polo 45 Chronograph is handsome and stylish. The 45mm sized case is made out of titanium and has a sporty silver dial, index markers, and a rubber strap with steel hinges. The automatic movement is manufactured in-house with a flyback chronograph and second time zone GMT function, sweep seconds, and big date complication. The bracelet is crafted from stainless steel, titanium and rubber. 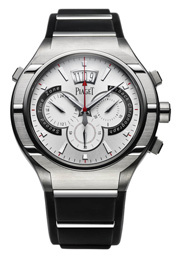 The Piaget Polo FortyFive Chronograph watch is water resistant to 100 meters.